I love the feel of yarn moving through my fingers . . . It is so relaxing and productive all at the same time! About 3 years ago I picked up a pair of knitting needles, after over 35 years of not knitting! I really can't tell you why I stopped knitting, but from my experience, it's not like getting back on a bicycle! I didn't remember a thing! Thank God, there are wonderful videos out there to take you step by step through the process. Whether you've never learned to knit, forgotten everything . . . like me, and are a lefty to boot, out in "virtual land", there are very knowledgable, and helpful folk to help you! I decided to take up knitting again to provide my family with soft cotton, biodegradable, washcloths and dishcloths. What I discovered is how much pleasure I get from working with different yarns! I love all the colors, patterns and textures to choose from! When I've been on my feet too long and my back is screaming, I can sit a while in my recliner, with my feet up, pull out my knitting needles, rest, and still be productive! There just doesn't seem to be anything that goes better with my homemade cold-processed soaps than a customized washcloth! Everyone appreciates a 4-pack of bright new cotton dishcloths! Both of my moms . . . my Momma and Will's Mom, love me to make them new batches of dishcloths, color coordinated with their kitchens. I love the fact that these cotton cloths never seem to get smelly, like store bought ones do. Small scale projects, can be tucked into my purse and taken anywhere to work on. Sitting in a waiting room, riding on an airplane, or waiting in a car, becomes a time of productivity, and not just "wasted" time! The sky's the limit on how simple or fancy you want to get with your creations! You're in control of the color, size, pattern . . . It's the perfect way to learn how to knit without committing to some huge project. It is also the perfect way to practice new knitting skills, and become a more advanced knitter or not! 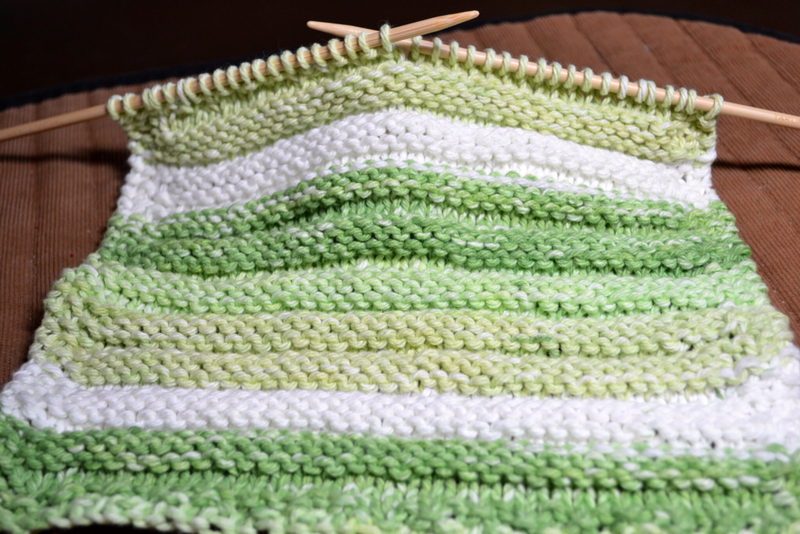 This simple pattern will make a lovely, large, washcloth! 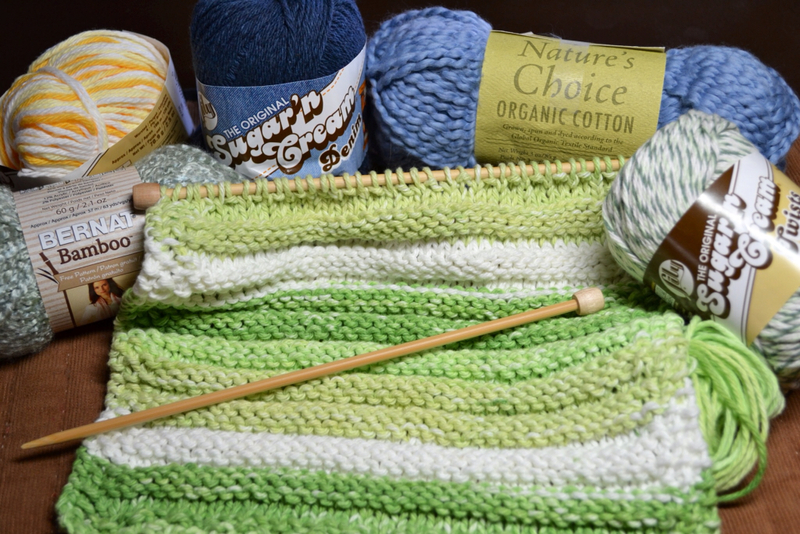 Use a cotton, medium weight (#4) yarn like Sugar'n Cream or Nature's Choice Organic Cotton. I have a simple border around my washcloth made up of (K P K). Rows 1-3 K P to end (forming border). Row 4 (K P K), K to last 3 stitches, (K P K). Row 5 (K P K), P to last 3 stitches, (K P K). Row 6 (K P K), K to last 3 stitches, (K P K). Row 7 (K P K), K to last 3 stitches, (K P K). Row 8 (K P K), P to last 3 stitches, (K P K). Row 9 (K P K), K to last 3 stitches, (K P K). Alternate between rows 4-6 (10x) and rows 7-9 (9x). Finish with rows 1-3 for border and Cast off. Will only uses my hand-knitted washcloths and soft chenille face towels for wrapping around his face to soften his beard before shaving. This past Christmas, I made each of my granddaughters a soap-on-a-rope, in their favorite color, with a matching round washcloth, and they loved them! You can also knit boy's washcloths with bears, dinosaurs, puppies, airplanes, race cars etc. or make a collection of soft little wash clothes, in pastel colors, for the babies in your family! If you haven't picked up a set of knitting needles, this would be a great time to start! Circular, bamboo knitting needles are my preference. They cost more than the plastic and aluminum ones, but are smoother to use. I purchase my knitting needles using a coupon from one of the craft stores. Whip up a dishcloth or washcloth and drop me a note to let me know . . . Over at Julie's!! !